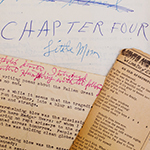 The Rare Book and Manuscript Library has created an interactive website featuring memories of Pulitzer Prize-winning poet Gwendolyn Brooks and items from her papers housed at the University of Illinois. The website, “Celebrating Gwendolyn Brooks@100,” was created for the centennial of her birth. CHAMPAIGN, Ill. — In celebration of the 100th anniversary of the birth of poet Gwendolyn Brooks, a new interactive website features personal stories about Brooks and materials from the Gwendolyn Brooks Papers housed at the University of Illinois Rare Book and Manuscript Library. The Story Map Journal website “Celebrating Gwendolyn Brooks@100” was created by the Rare Book and Manuscript Library. It includes stories of those who met Brooks at libraries and schools around the state; correspondence, notes and photos from the Gwendolyn Brooks Papers; and a map of public libraries throughout the state that are participating in Brooks@100 events. 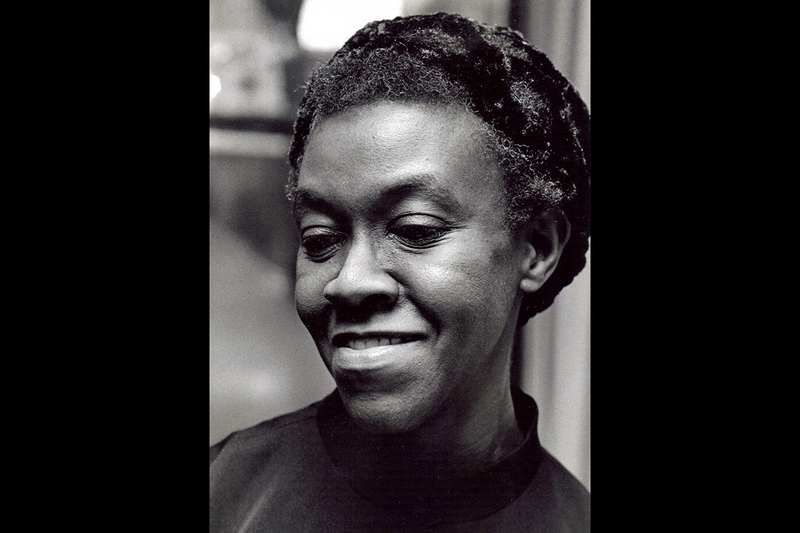 The Gwendolyn Brooks Papers includes manuscripts, drafts, correspondence, notes, scrapbooks and clippings. Born June 7, 1917, Brooks was the first African-American to win a Pulitzer Prize, awarded in 1950 for “Annie Allen,” her second book of poetry. She was Illinois Poet Laureate for 32 years, from 1968 until her death in 2000. The goal of the website is to “show the scope and ongoing impact she’s had across the state,” said Eva Miller, an administrative and program assistant at the Rare Book and Manuscript Library, and one of three people who created the Story Map website. A former librarian at the Champaign Public Library wrote a brief reminiscence of meeting Brooks at a library event in 1993, which she called the highlight of her library career. The website links to copies of both the letter the librarian sent to Brooks, which was among the Gwendolyn Brooks Papers, and the thank-you note she received in return. One of the photos on the website shows a boy tossing a basketball to Brooks at Gwendolyn Brooks Junior High School in Harvey, Illinois. The Rare Book and Manuscript Library staff has encouraged public libraries in the state and people with whom Brooks corresponded to share stories of her to be included on the Story Map website. “The intention is to see it grow throughout the year. It’s an open invitation for people to send stories in,” Miller said. She’ll speak about the website at a BrooksDay event at the Reva and David Logan Center for the Arts in Chicago. The center organizes a BrooksDay celebration each year on June 7. This year’s event is BrooksDay@Nite, an evening 100th birthday celebration that will feature 100 one-minute poetry readings, remembrances and performances. 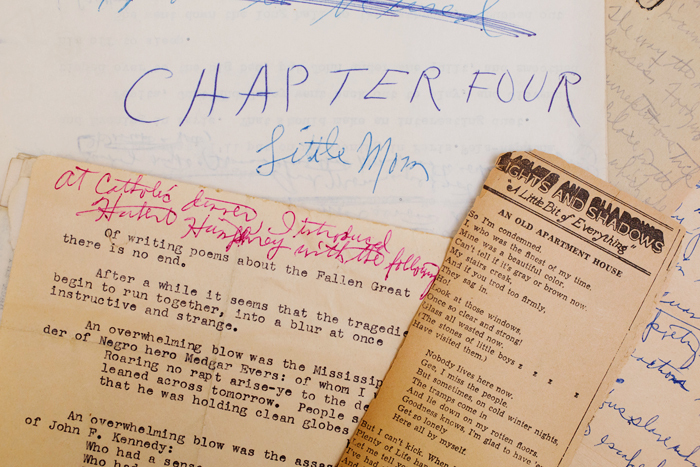 Later this month, items from the Gwendolyn Brooks Papers will be on display at an exhibition at the Poetry Foundation in Chicago. “Matter in the Margins: Gwendolyn Brooks at 100” opens June 16. Brooks was an inveterate note-taker and self-chronicler, said Anna Chen, a curator and archivist at the Rare Book and Manuscript Library, and the exhibition will feature notebooks and scraps of paper where Brooks jotted down observations of daily life, her thoughts on others’ ideas and her future plans. Chen curated the exhibition and is also one of the creators of the Story Map website. She will speak about cataloging the items from the Brooks archive at the opening of the exhibition at the Poetry Foundation. The exhibition will move to the Rare Book and Manuscript Library in the fall. Editor’s note: To reach Eva Miller, email emillr@illinois.edu.